Viagra generico. comprare viagra è facile, ci sono diversi dosaggi. Sildenafil dovrebbe venir assunto circa un'ora prima del rapporto sessuale sebbene i MV Mermaid I is proud to offer our exciting Indonesia schedules to your valued guests. We dive the best of the best, we know where and when it’s running! As well as our awesome Bali-Komodo-Bali cruises we now also dive the truly spectacular destinations of Raja Ampat, Ambon, Banda Sea, Alor, Lembeh Triton Bay and more! real levitra sample pack Launched in 2014, Mantamae is a gorgeous Phinisi boat style. The Mantamae captures the spirit of Indonesia and offers a unique opportunity to experience her beauty. The ancestors to the modern Phinisi are the vessels that transported spices from the islands known as the “East Indies”. enter Lady Denok is a phinisi ship that was completely built in late January year 2016. 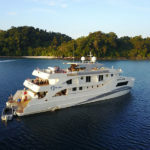 With 7 cabins, Lady Denok can accommodate 12 divers to cruise all over Indonesian archipelago. We assure you that our services to all of our guests will be extraordinary, as our crews are experienced in liveaboard to guide your under water tour. 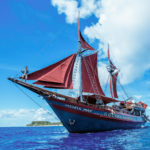 Come aboard the Kurabesi Explorer, a 28 meters traditional Phinisi schooner that provides a spacious, luxurious home from which to experience the untouched beauty of the islands of Papua. Created by a locals social entrepreneur, the Kurabesi Explorer will not only provide you with a holiday of a lifetime, but will also give you the opportunity to engage with and support local indigenous communities, enjoying their warm hospitality, while contributing to community projects. 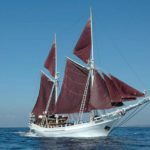 The M/S Katharina is a traditional Indonesian “Phinisi” liveaboard is a classic, elegant yacht scheduling exciting cultural immersion trips through the eastern Indonesian archipelago year round. The 12 member crew onboard Katharina are extremely knowledgeable and passionate about the area and will ensure an authentic adventure for every guest. 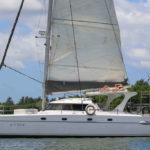 Jemme is a 43 foot/13 meter long sailing cat boasts 1120 square feet of sail, making this vessel one of the fastest in her class. This triple-deck, twin-hulled beauty offers 4 cabins with en-suite facilities ideal to sleep up to 6 guests overnight. During the day, couples or families of up to 16 guests can enjoy her broad decks in the open air or in air-conditioned comfort. The Gaia Love is a modern 40 meters steel hull vessel build from the ground up in Batam, Indonesia. 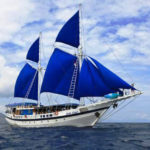 It is purpose built to sail and explore the far reach regions of Indonesia and complies with class requirements of BKI (Biro Klasifikasi Indonesia). 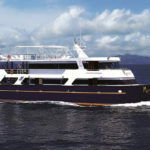 Designed with a modern contemporary look with an emphasis for diving in comfort, she accommodates up to 20 guest in 11 spacious en-suite rooms; six on the upper deck and five on the lower deck. The Forever Rizzardi is an imported Italian Luxury Yacht. We offer full day trips to South Lombok, Kuta Lombok, Nusa Lembongan and Gili Air, departing from the marina in Benoa Harbour Bali. 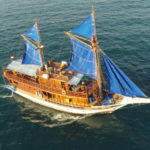 It is perfect for day charters for groups of up to 8 guests desiring a leisurely cruise of Bali’s water. 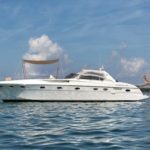 The yacht can accommodate a couple in double cabins, plus two more guests in at win cabin for longer charters. Euphoria is a diving vessel completed in 2012. Each cabin has a private bathroom, central air conditioning and is decorated with Indonesian craft. On the lower deck there are 7 cabins for our guests. All of them have the same equipment and convenience, but because of structural reasons there are a little differences in arrangement of beds and their size.